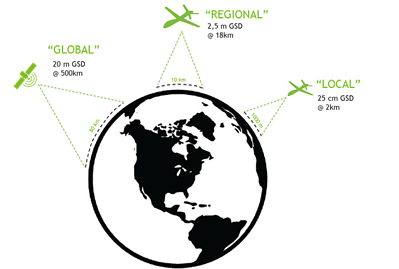 In satellite earth observation, platforms and instruments are being miniaturized to improve cost-efficiency. At the same time, higher spatial and spectral resolutions are pursued to enable precise monitoring of changes in land cover, land use and climate. All the reason to develop a new hyperspectral camera. Let me introduce you to CHIEM, an engineering model of a novel compact VNIR hyperspectral imager suited for use in space, drone, airborne and stratospheric applications. Check out our journey towards a hyperspectral imager as small as a shoe box but with the potential of offering a large swath of 80 km and a GSD of 20m from 500km altitude. 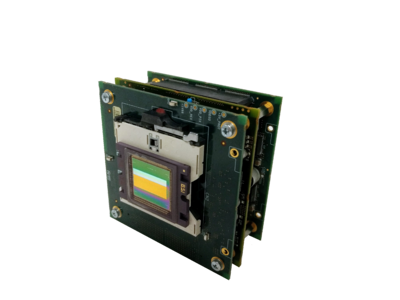 The CHIEM image sensor is the youngest but also most powerful member of the LVF based hyperspectral imagers family, which includes the COSICAM and Butterfleye LS cameras. CHIEM is built on a large 12 MPixel CMOS sensor and provides the unique configuration of two panchromatic channels and 154 spectral bands covering the 470-900 nm wavelength range, enabling high spatial and spectral resolution imaging. The sensor chips have been produced and characterized and we are currently preparing an In Orbit Demonstration mission. 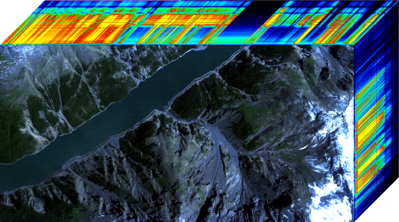 Traditionally hyperspectral imaging from space is performed by large satellites. These are very costly missions of which only few can be built which leads to long revisit times. By building hyperspectral instruments on much smaller scales suited for cubesat platforms, it will be possible to launch a constellation of hyperspectral satellites which would give almost daily information on for instance plant health status allowing quick responsive action useful for agriculture and forestry. A first example is the Hyperscout hyperspectral imager launched in Feb 2018 and which has acquired its first images from space. The CHIEM hyperspectral sensor is based on thin film interference filters technology on a 2D detector array. Conventionally, such thin film filters are deposited with a linear thickness variation on a glass substrate and mounted on the detector afterwards. CHIEM however uses a novel technique developed by imec in which the filter material is deposited directly onto the detector at wafer level with pixel precision, enabling flexible geometric filter designs and also reduces sensitivity to stray light. the deposition of the filters on Backside Illuminated (BSI) sensors. This gives a two to three times higher sensitivity in comparison to the traditional Front Side Illuminated detectors and a better spectral behavior. the inclusion of two panchromatic views on the same sensor, one at the top and the other at the bottom of the sensor, which allows “normal” imaging enabling a sharper hyperspectral vision. But a fancy high-tech camera alone is of course not enough. We also need to be able to transform the raw data into consumable information and that’s why a new, innovative image processing engine entered the scene to construct the hypercubes providing the spatial and spectral information. To allow a flexible way of handling the enormous amount of data (up to 22Gbps) a dedicated Read Out Electronics was built by deltatec. It allows a reconfigurable sensor setup (frame dependent) using different exposure times and selection of Regions of Interest and to apply image corrections before compression. The maximum frame rates in 10/12 bit mode is over 100 frames per second. The optical design by AMOS was made to be able to fit the instrument on a 12U cubesat platform. The compact front telescope is a fully reflective Three Mirror Anastigmatic telecentric design providing a wide field of view (> 9.5o x 7.2o) with limited distortions. Including baffles, the required instrument volume is 300 x 200 x 130 mm3. The CHIEM sensors have been produced and spectrally characterized at this stage. We look forward to continue our work in building a full proto-flight model instrument for an In Orbit Demonstration with the ultimate goal to have a constellation of satellites. For more information, you can visit the web page on camera and sensor development.